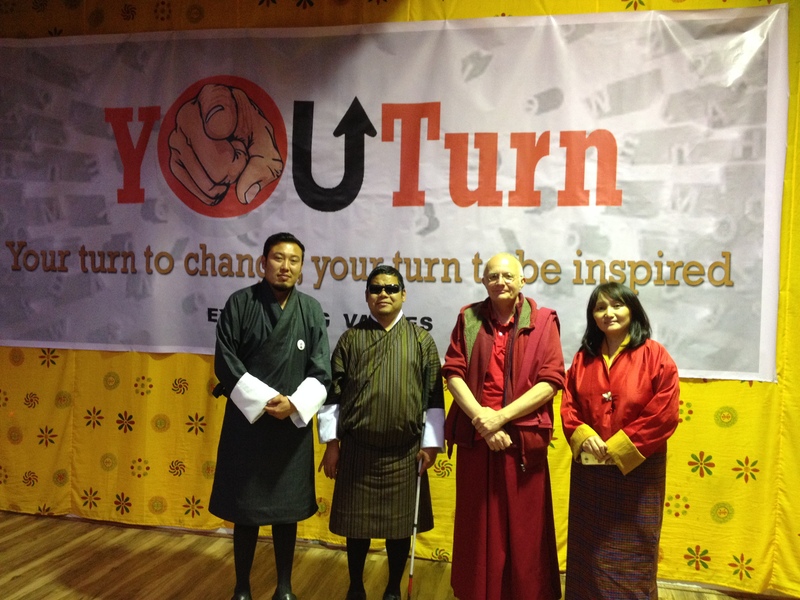 During the fifth YouTurn event held at DYS Auditorium in Thimphu on the evening of Friday, 31st March 2017, Lama Shenphen Zangpo made his message to the youth of Bhutan loud and clear. Speaking from the Buddhist’s perspective, he said that a peaceful mind is the most important factor that can promise a happy and content life. If your mind is not in peace, you will never be happy even if you are the richest person in this world. So whether you are happy or not mainly depends on your inner peace and self-contentment. As Buddhists, we don’t have to try to become good human beings because we are born with natural goodness or the Buddha Nature. The only thing we should do is to cleanse ourselves from the negative qualities such as desires, ignorance, jealousy, greed, and ego and anger which chain us to endless suffering and pain every day. We should never let those factors obscure our mind and block our path to enlightenment. Another major source of unhappiness is that we focus too much on what we don’t have and often forget to focus on what we have. It is important to be content with what we have because too much expectations would always bring disappointments and frustrations. If we learn to appreciate what we already have, we can have a happier life than the rest of the people. In a nutshell, the following were some of the key messages he conveyed to the youth of Bhutan. First, he said that if we can celebrate the achievements and successes of other people and share their happiness, we will always have a reason to smile. If we get jealous whenever somebody else gets a new car or gets a promotion, we can never be happy in our life. But if we learn to share their happiness and join them in the celebration of the achievements, we can be happy forever. We will have no reason to be jealous and angry. When asked about his views on the use of drugs, he said that it is important especially for young people to keep in mind that taking drugs is never a solution to their problems. It can only mess them up and destroy their life. It is important to recognize that drugs do more harm than good to both mental and physical health of a person and that people should never use it as an excuse to overcome their challenges. Nobody is born with a golden spoon in the mouth. We all have our own share of challenges in life. So using drugs should never be an option to address the problems. If you don’t believe that taking drugs is harmful, you can do your own research online. None of the recovering addicts would say that they are proud that they have used drugs. Everybody would say that they feel they should not have put that first tablet in their mouth. While talking about the possible causes of stabbing and gang fights, Lama said that stabbing cases happen only when everybody carries a knife. He believes that if nobody carries a knife, there would be no stabbing cases or gang fights in Bhutan. Whenever he gives a hug to those drug users whom he mentors, he always makes sure that they don’t have knives with them. Although everybody says it’s for self-defence, it becomes dangerous when they are under the influence of drugs or alcohol. He believes that if a person does not take out his knife, the other person won’t take it out and even if he takes out, he would not stab because he does not feel threatened. Once again, if we practise basic human values and Buddhist philosophies, we can control our anger and prevent the situation from getting worse. There is nothing wrong when you choose to run away when you feel you are in danger. You should be able to fight your ego and anger. In the view of the above words of wisdom, it can be generally concluded that Lama Shenphen Zangpo’s talk was filled with great values that could help youth lead a meaningful life. He pleaded with all the youth of Bhutan to focus on positive things around them and to recognize their good virtues. He told them that they should feel fortunate to be born in Bhutan where they are given free education and health services, and that they should be able to take advantage of all the wonderful opportunities the government is providing. Even a single youth is a precious soul and an asset of the nation. They should not waste their precious life indulging in undesirable and unhelpful activities. They should know that they are carrying with them the dreams and aspirations of their parents, teachers, the government and His Majesty the King that they would grow up to become responsible citizens of Bhutan. The talk was very inspirational and insightful. A total of about 70 youth were in attendance during the event. Lama Shenphen Zangpo is a Buddhist monk from the United Kingdom who has studied and practised Buddhist philosophies in different parts of the world for more than 28 years. He first came to Bhutan upon the invitation of His Eminence Zongsar Jamyang Khentse Rinpoche and over the past eight years or so, he has been mentoring Bhutanese youth and helping young drug users make positive changes in their life. During the National Day celebration in Trongsa in 2016, he was awarded the National Order of Merit Gold by His Majesty the King for his contributions as a youth mentor. He works with young drug users and mentors them to help them make positive changes in their life. Anybody who needs his help to deal with addiction problems can reach him in either Lama Café in Hongkong Market or the Ambient Café, opposite to Druk Punjab Bank in Thimphu.